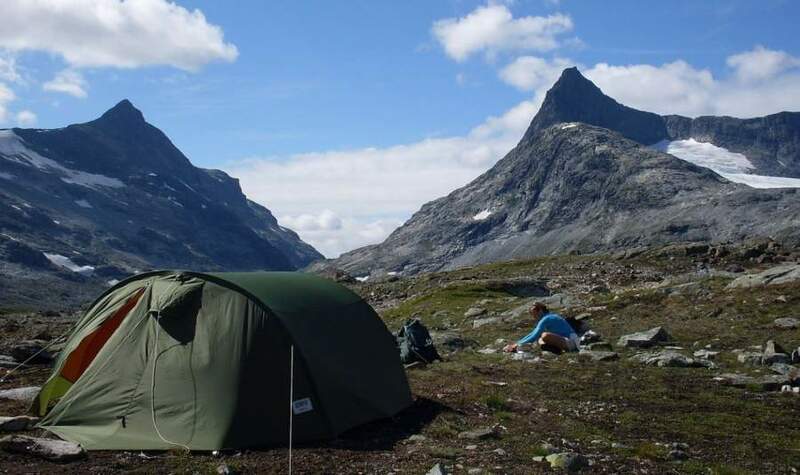 Here you have a list of the best tunnel tents for camping currently available on the market. Many of them are with an impressive waterproof rating and all are suitable for 3-season use. If you follow the developments in the tents industry you will notice that most of the tunnel type tents on Amazon come from the European brands. They also share some common features which include PVC windows, the absence of mesh on the ceiling, multiple rooms, impressive waterproof rating, etc. This is partly due to climate, so they are built as enclosed structures that keep the warmth and prevent too much draft. Not every tunnel type tent is suitable for a very warm environment, in fact the majority of the models here in the list are better suited for a cooler and wet area. Tunnel tents are rarely freestanding, this is due to their design (but you will see some great exceptions below in the list). You always have many guylines to stake them to the ground. So bear this in mind when you plan your camping spots. Note also that most of those presented here belong to what is called dark rest or lights out tents (some call them also blackout tents). This means that the sleeping area is darker, the daylight is reduced and you can sleep longer in the morning. Air beam tents. These are with inflatable beams instead of poles. Some of them have both classic poles and inflatable beams. 5-room tents. Yes, you are reading correctly, there are many of them here with such an incredible structure. One of the tents is insulated, so again, yes you are reading correctly, this is a unique item among all tunnel tents on the market. Note that this list is just a selection and some of them are just representatives of series (for example in the case of the tents for 5, 6, and 8 people sometimes I present only one here). So just to know, there are many more tunnel-type tents presented here in the site, please check in the Category tunnel tents. The X-Loft 6 person tent is quite different from all other tents here. It is small when compared with others and light enough to be carried on the trail. 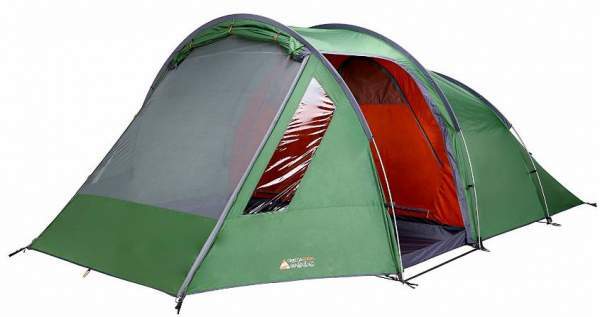 But this is also a double-layer structure with an inner tent and a full-coverage fly. So it looks like a dome tent but indeed this is a tunnel structure. It offers 85 ft² (7.9 m²) in the inner tent and this is quite modest. But there are also two vestibules with the total area of 46.5 ft² (4.3 m²). So the total covered area is 131.5 ft² (12.2 m²). The waterproof rating is 1800 mm for the fly and 2000 mm for the floor, quite enough for a 3-season camping. Please read more in my full review. This MSR tent is here in the list because of its tunnel construction. But this is an interesting freestanding design, unusual for a tunnel tent. But it is more than that, this is a tent built specifically for extreme winter conditions and expeditions. Therefore, it is incredibly strong and also incredibly expensive. You have an area of 108 ft² (10 m²) and two doors on the opposite sides and vinyl windows. This is a simple single room and single layer construction. The waterproof rating is huge, so fou have 3000 mm for the main body, and 10000 mm for the removable floor. The aluminum poles are very thick and strong designed to withstand lots of snow. Please follow the link for more. Exped Ursa VI Tent with fly. This Exped Ursa VI tent is a rare example of a freestanding tunnel tent. It has three loop poles that create arches, but there is also one extra ridge pole that crosses the loop poles, and this is what makes the structure self-supporting. Yet another great thing is that this is a double-layer tent and with a full coverage fly. So I have included it also in my list of tents with full fly. The fly creates two large vestibules on the two sides. The tent has 2 rooms and the floor in the front smaller room is zippered so you can roll it to the side if you want. But this space can also be used for sleeping. The capacity is up to 6 people and the tent offers the total protected area of 122 ft² (11.4 m²). The inner area is 88 ft² (8.2 m²). The poles are top class DAC Featherlite TH72M aluminum. The waterproof rating is 1500 mm for the fly, and 5000 mm for the floor. This is nylon rip-stop, so you have top-notch materials used here. Therm-a-Rest Tranquility 6 Person Tent. This Tranquility 6 tent is a tunnel-shape tent of a particular type. It has two loop poles on the two ends that create a very unique arched poles structure, plus the pole in the middle that is Y-shaped on both ends, so this central pole makes the tent freestanding. But there is more to this, the same split-pole supports vestibules on the two ends, and these vestibules are a part of the tent itself and not created by the fly. The area is relatively small for 6 people, you have 66 ft² (6 m²) of the inner space plus 32 ft² (3 m²) vestibule area. The tent has 2 rooms, 2 doors, and 2 vestibules, and it is very tall, with the doors on the opposite sides. You have quality materials here, the poles are aluminum, the waterproof rating for the fly and tent is 1500 mm and 10000 mm for the floor. Please follow the link for more. The Rocky Mountain 5 Plus is a really nicely designed tent for 5 people. Its floor area is 120.5 ft² (11.2 m²) and this means 24.1 ft² (2.24 m²) per person, so this is a luxurious option for small families. The structure is with 3-rooms; one living room on the front and two sleeping rooms on the back. They have built it with what they call the blackout technology, so it blocks 99% of the daylight in the sleeping zone. The tent is with 4 PVC windows and its waterproof rating is 4500 mm. So this is a very reliable camping tent for a 3-season use. Please read more in my detailed review. Wenzel Vortex 8 Person Tent. The is a tent with air beams. The floor area is 135 ft² (12.5 m²) and its declared capacity is 8 people, so for a real camping it is best to downgrade it a bit for a smaller number of people. This is a 2-room structure, you have a removable divider inside. The tent is a single layer design, there is no mesh here and it is better suited for a cooler environment. But no worry, it is equipped with vents and there is mesh on the windows and on the door. The waterproof rating may look small when you compare with most of the tents here in the list, so you have 800 mm, but this is a nicely built relatively lightweight tent and this is why I have included it here in the list. I also wanted to give more diversity regarding the brands because the list could be populated and dominated by Vango and Eurohike tents alone. 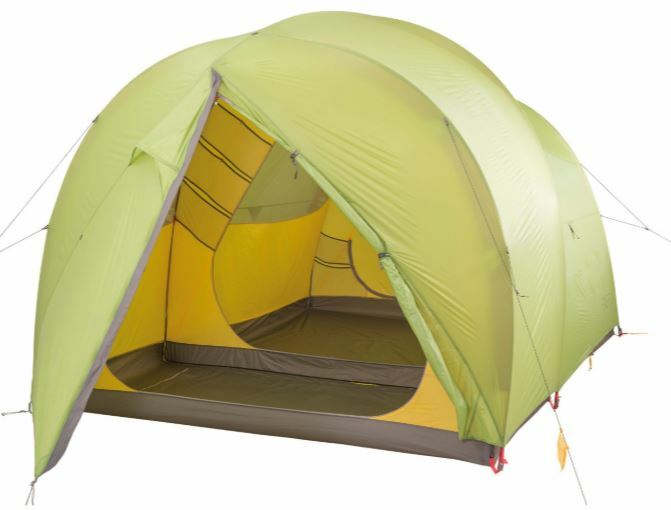 The Tempest 500 is a tunnel tent of a particular type, without any classic rigid pole and you have air beams instead. It is with the declared capacity of 5 people and the area is 142 ft² (13.2 m²). You have 3 rooms here, and they include two sleeping rooms that are a tent within the tent, plus one large living room. 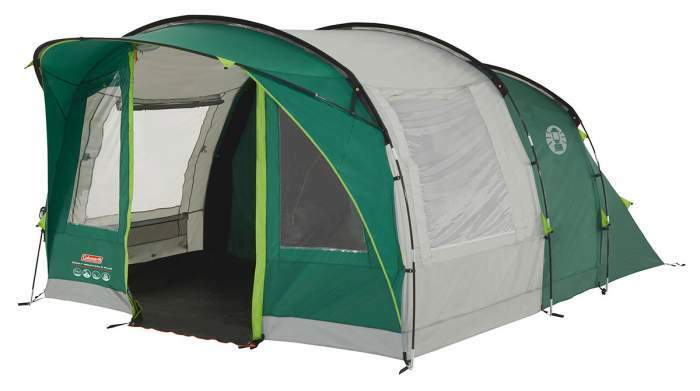 The tent is with two entry doors and two inner doors, and you also have three PVC windows. So this is a very enclosed structure and I see it best suited for a cooler climate. The tent comes with a zippered e-cable port and a fully sealed main floor. The sleeping area is with its own extra floor so you have two layers there. The waterproof rating is 3000 mm for the shell, and the floors are a thick and fully waterproof polyethylene. This Omega 500 XL tent looks relatively small with its 151 ft² (14 m²) floor area, but this is still a 3-room structure for 5 people. You have 2 PVC windows and 2 large doors here. The sleeping zone is with two rooms and this part is a tent within the shell tent. The floor in the living room is detachable. The waterproof rating for this tent is impressive, no less than 5000 mm for the shell tent and 6000 mm for the floor. 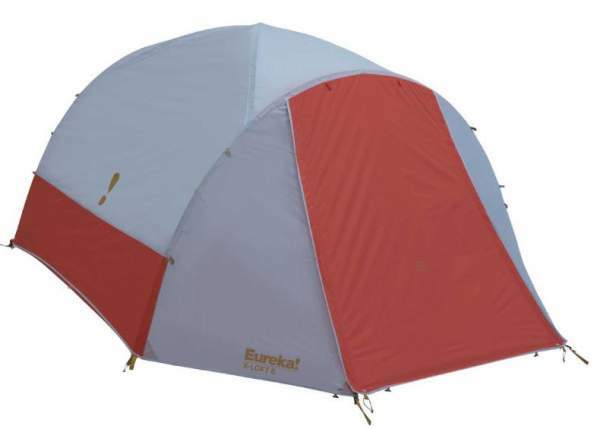 So this is a great tent which will protect you in any weather conditions in a 3-season use. Please see more in my detailed review. The Woburn 500 is a 3-room tent with a large living room which you see in the picture, and the sleeping zone divided into 2 units. This all is for 5 people, and the area is 160 ft² (14.9 m²). The tent is also with what they call ‘lights out’ design, which is the same as the dark rest design. You have large PVC windows and gigantic doors. The waterproof rating is great, you have 4000 mm for the fly and 10000 mm for the floor. Please read more in my full review. 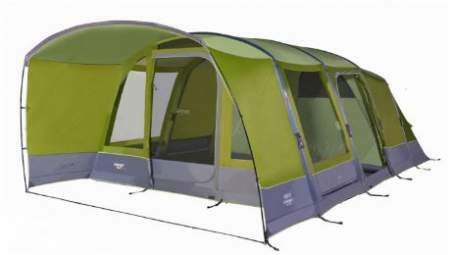 Coleman Galileo 5 Tunnel Tent. The Galileo 5 is a very typical tunnel tent for 5 people, the structure is with 3 fiberglass poles which give it the shape. You have 3 rooms here, two sleeping units plus a large living room. The total area is 161.4 ft² (15 m²). The tent is without mesh, fully enclosed and with solid PVC windows, the floor is fully sewn in and sealed. For these reasons, I have included it also in my list of tents for a cold environment. The waterproof rating is impressive, you have 3000 mm for the shell and 10000 mm for the floor. The tent is with 2 entry doors, two inner doors, and you have 4 windows in total, all with inner shatters for privacy. Please read more in my full review. The Chanty Deluxe 5 is a tunnel type tent with three pre-bent poles that create its tunnel structure. This is a tall tent with 215 cm peak height, and it offers 161 ft² (15 m²) of fully protected area in its 3 rooms. The sleeping area includes two separate tents and this is a double-layer zone, and in addition, you also have the pleasant living room shown above. The tent is with 3 large doors and all are equipped with mesh and panels. There are also two zippered windows that are with mesh and panels. The inner tents have their own floors with 2500 mm waterproof rating, but you also have a fully sealed second layer, the main polyethylene floor which is fully waterproof. The waterproof rating for the shell is 2000 mm. The poles are fiberglass. 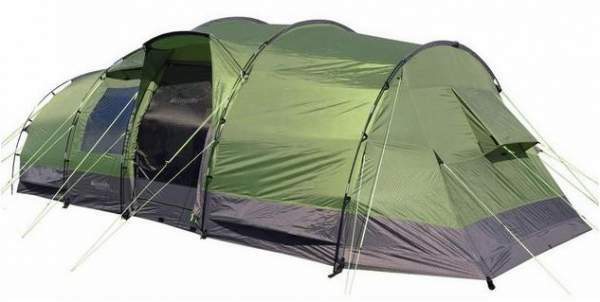 This is a true 3-season tent with excellent ventilation based on 6 vents around and on the mentioned mesh windows and door. It comes with numerous stake points and guylines to secure it against winds. Outwell Nevada 5 Man Privilege Tent. The Nevada 5 person tent is a typical tunnel structure created with its three fiberglass arches. This is a fully enclosed design with tinted PVC windows. The tent is without mesh, the floor is fully sewn-in and sealed. You can regulate ventilation through several vents and through its three doors that are double layer type with mesh and with waterproof panels. Such a construction keeps the warmth and this is why I have included it in my list of cold weather tents. The waterproof rating is huge 4000 mm for the shell and 10000 mm for the floor. You have a 3-room design with 2 sleeping rooms and a huge living room. Because of the sealed floor, several more people can sleep in the living room there if necessary. The area is 15.16 m² (163.2 ft²) so you have 3 m² (32.6 ft²) per person if the tent is used by 5 people. Please read more in my full review. 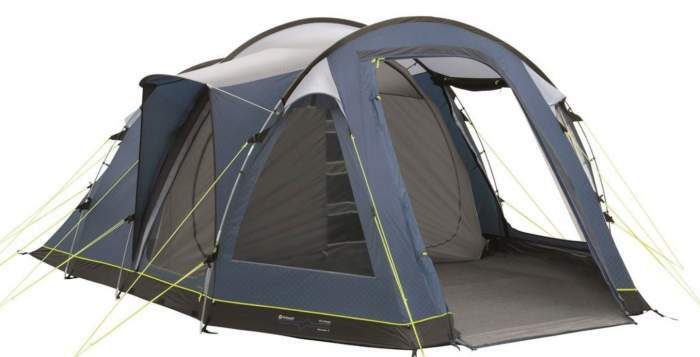 This Proxes 6 person tent is a 3-room structure suitable for 3-season camping. It offers a large front living room and the sleeping area which is a tent within the tent with two rooms with a removable divider. There are 3 doors and one window, but only one of the doors has mesh and panel. The window is with both mesh and panel as well. You have 4 vents for ventilation. The waterproof rating is 2000 mm for the shell and 2500 mm for the inner tent plus more than 10000 mm for the shell floor which is fully sealed. So clearly you have all protection from the rain. The poles are fiberglass, so this is not the best but you have the same material used in many tents here in the list. The tent’s area is 167 ft² (15.5 m²) and it weighs 32 lb (14.5 kg). Please follow the link for more. 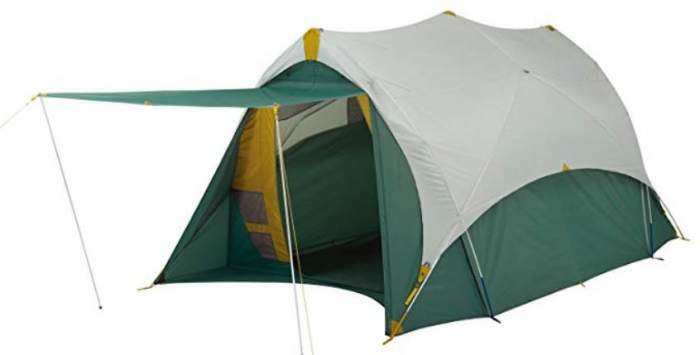 The Overland 10 tent is a 3-room structure with real sewn-in walls. As you realize from the picture, this is a very typical tunnel-shape design but with the side entry. They describe it as designed for hunters, and it can be used also as a basecamp tent. It offers 169 ft² (15.7 m²) of the floor area. For family camping, its official capacity of 10 people should be downgraded to a maximum of 6 people. Note that it packs nicely to only (L x D) 26.5 x 10.25 inches (67 x 26 cm). 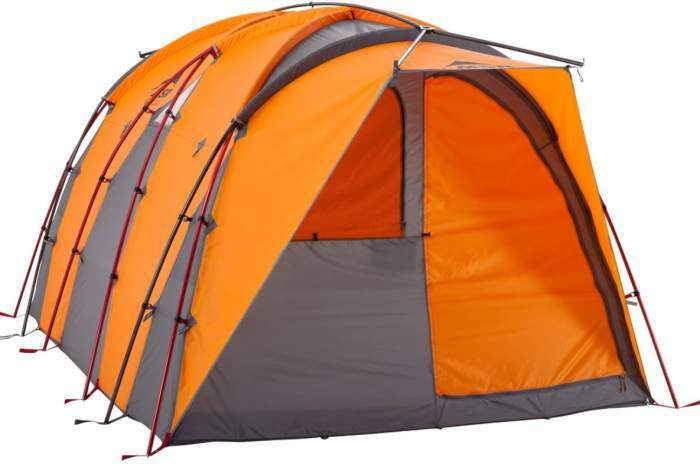 The tent is pleasant and tall structure, with 5 double-layer windows, one entry door, and two inner doors. You might want to know that the floor is fully sewn-in and sealed. The waterproof rating is not particularly high, 1200 mm for the shell and 1500 for the floor, but the poles are a strong steel and aluminum combination. Please follow the link to read more. This is a tent from the great Rydal series, note that there is also the Rydal 500 presented here in the site. The tent is a 3-room construction and it offers 181 ft² (16.81 m²) for 6 people. So clearly, this is a very luxurious camping option, but at the same time this is a budget-friendly tent because you pay only around $186. The tent is with 2 large doors here and 2 PVC windows, so the structure is very enclosed but you have 5 vents. Note also that you have 18 storage pockets, well, I said it was luxurious. The waterproof rating is 2000 mm. Note also that this is a dark rest design. Please read more in my full review. The total covered area with the porch included is 230 ft² (21.4 m²), while the inner area is 192 ft² (17.8 m²). So in the inner area you have 32 ft² (3 m²) per person, and this space is organized into 3 separate rooms. Other features include 2 external doors and 2 internal doors, 5 PVC windows, a porch, and an awning configuration shown in the picture. The inner tent fabric is from a darker material so it belongs to the group of the dark rest tents. There are many storage pockets inside. Please see more in my review. 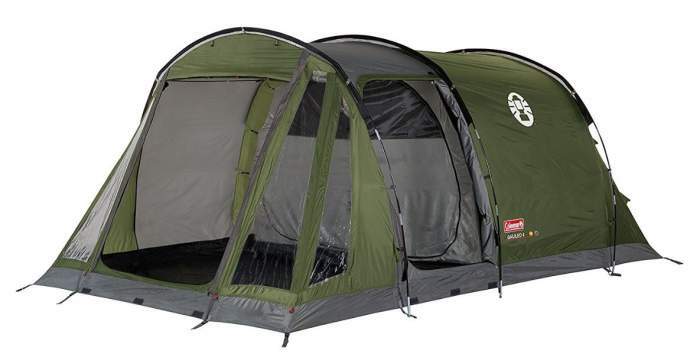 The Vango Marna 600 XL has 192 ft² (17.8 m²) of the inner floor area, and you also have a porch which is fully protected so the total protected area is 267.3 ft² (24.8 m²). I have included it in my list of 4-room tents, but such a closed porch is just like a room although it is floorless. You have 3 sleeping units which are a tent within the tent, plus a large living room. There are 11 PVC windows so imagine how pleasant this structure is. The sleeping area is also with what they call the lights out design. The waterproof rating is impressive, you have 4000 mm for the shell tent and much more for the floor. Please read more in my full review. 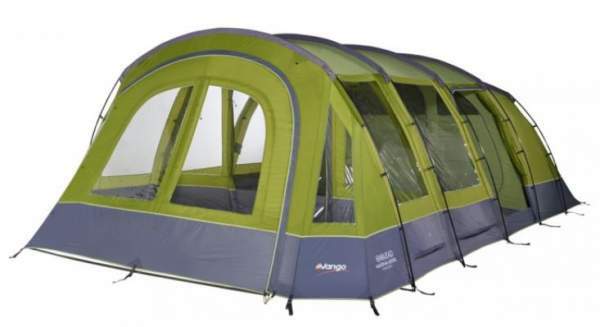 Vango Capri 6 Air Beam Tent. This is one of several tents with air beams. Only the front vestibule pole is classic. This is a luxurious option for 6 people, it offers 194 ft² (18 m²) of the inner area plus the porch with 41 ft² (3.8 m²). Note that they have yet another version of this tent for 5 people. The main part is a single layer structure, but the sleeping area is a tent within the tent. You have huge PVC windows so the design is such that it preserves the warmth and the tent is suitable for camping in a cooler environment. Note that ts waterproof rating is impressive 4000 mm. Please read more in my review. Vango Odyssey Air 800 Tent. 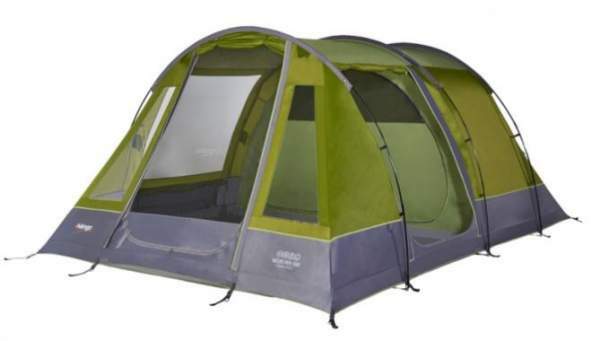 The Odyssey Air 800 is what its name says, a tent with air beams instead of classic poles. This is also an incredible structure with 5 separate rooms. The tent is for 8 people, at least by the declared capacity, but you have 200 ft² (18.59 m²) of the floor area. This means 25 ft² (2.32 m²) per person. The tent has 2 doors and 2 PVC windows, so the structure is fully enclosed and pleasant. See also its impressive waterproof rating, 4000 mm is definitely more than enough for any conditions in a 3-season use. Note that they also have the 5-person version of this tent and 6-person as well. Please read more about the Odyssey Air 800 in my full review. Eurohike Buckingham 8 Classic Family Tent. This is again a tent with 8 people declared capacity, but see its floor area of 226 ft² (21 m²). Here too you have 5 rooms. This includes two sleeping areas on the two sides, each with two rooms, plus a large living room in the middle. Note that they also have the 6-person version with similar features but with 4 rooms. You have 4 PVC windows and 3 doors which allow for 3 awning configurations. The tent is without mesh but you have many vents so ventilation is very good. Note that the floor is removable. The inner tents are also removable and you can organize the inner area as you wish, dependent on the number of occupants. More in my full review. The Stanford 800 XL is an 8-person tent with 227 ft² (21.1 m²) of the area organized in 5 rooms. The tent is with 2 doors and 2 PVC windows, and its waterproof rating is 4000 mm. With such properties, you will be fully protected in this tent in practically any weather conditions in a 3-season use. The poles are fiberglass and it is equipped with what they call the tensioned band system (TBSII) which stabilizes the tent from inside. But you also have multiple guyout lines to stake it to the ground. More in my full review. This is a tent with inflatable beams plus two classic poles used in the porch only, so this is a hybrid design. It offers 230 ft² (21.44 m²) in its 4 rooms, but this is not all, you still have 113.7 ft² (10.56 m²) under the porch. So imagine the space and the tent is with the declared capacity of 6 people only. The tent is with what they call the blackout design, and they claim it blocks 99% of the daylight. This results also in a bit cooler atmosphere in the tent during the day. There are 3 entry doors here and the windows are PVC. The waterproof rating is impressive 4500 mm. Under the large porch you have yet another interesting feature, the hinged door. Please read more in my full review. This is the only insulated tent here and on the market in general, at least when this is about tunnel tents; there is only one smaller cousin for 3 people but from the same brand. So how did they build it? There is an internal insulated cocoon and it is with the R-value 4. This is good for any weather conditions and in their testing at sub-zero temperatures it gave 18 degrees F difference between the outside cold weather temperature and the temperature in the tent. So this is a true 4-season tent. The inner area is 235 ft² (22 m²), but you also have additional 65 ft² (6 m²) under the porch. There are three rooms inside, two are small insulated and one is huge uninsulated living room. All windows are solid vinyl and the waterproof rating is impressive just like all other feature, you have 5000 mm here. Note that this is a breathable poly-cotton fabric. Please read more in my full review. 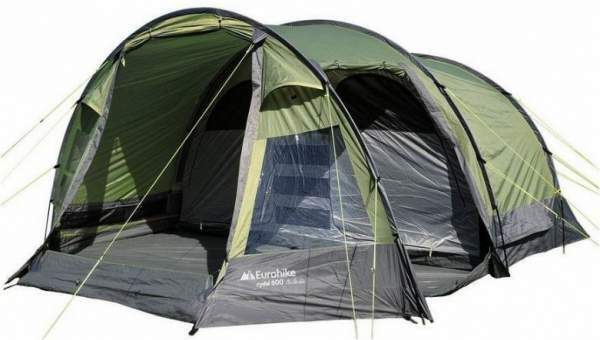 This Buckingham Elite 8 tent is the largest in the list so far, with 249 ft² (23.1 m²) of the floor area it offers 31 ft² (2.9 m²) per person. Note that they also have this Elite version for 6 people. The tent’s shell is with 3000 mm waterproof rating, so you should be fully protected regardless of where you camp. The floor is also fully sewn in and sealed. There are two entry doors, and one of them is with a short hood which you see in the picture, the other door allows for an awning configuration and the poles for this purpose are included with the tent. The windows are PVC, so they are fully sealed and also equipped with blinds from inside. The tent is without mesh, similar to the other tunnel-type models here, but there are no less than 8 vents in the fly so ventilation should not be an issue. Multiple storage elements are available in all rooms, and an electric cable port is also available. Please follow the link to see more in my full review. This is one of the giants here, and you realize this from its position in the list. Obviously, this is a very typical tunnel tent with 5 fiberglass poles that give it its tunnel shape. The tent is also fully enclosed with numerous PVC windows everywhere around, and the floor is fully sewn-in and sealed everywhere except for in the front room. This is why I have included it in my list if tents for cold weather camping. The area is 333 ft² (31 m²) and it is organized in 5 rooms. So yes, this is why it is in my list of extra large camping tents. Its official capacity is 6 people, but it can easily accommodate 12 people. The tent is with an impressive waterproof rating of 4000 mm for the shell, and for the floor, it is probably 10000 mm or so. But the poles are fiberglass and this is not its best feature. There are 3 entry doors and 4 inner doors. Please follow the link to read more. Strictly speaking, this Vermont XLP 7 person tent is not completely a tunnel tent. You could describe it also as a hybrid tunnel-cabin type and the reason is that all the side poles are completely straight so the side walls are just like in any cabin tent. But those poles together with the 5 roof poles create this nice tunnel structure which you see in the picture. This is a 5-room tent with 20 PVC windows, tinted and with shutters. The tent is very tall with its 86.6 inches (220 cm) and you have strong steel poles to support such a structure. The area is 371 ft² (34.48 m²) and the total weight is 125.5 lb (56.8 kg) in two separate packages. The waterproof rating is simply impressive like everything else here, 6000 mm for the shell tent and 10000 mm for the floor. It comes with a thermo-reflective coating and a dark rest design. Please follow the link to read more. So this was my list with the best tunnel tents for camping currently available on the market. As I mentioned above, there are many more tents of this type here in the site so please look around if you need something different. Note that this list will be updated regularly so bookmark it and check from time to time.